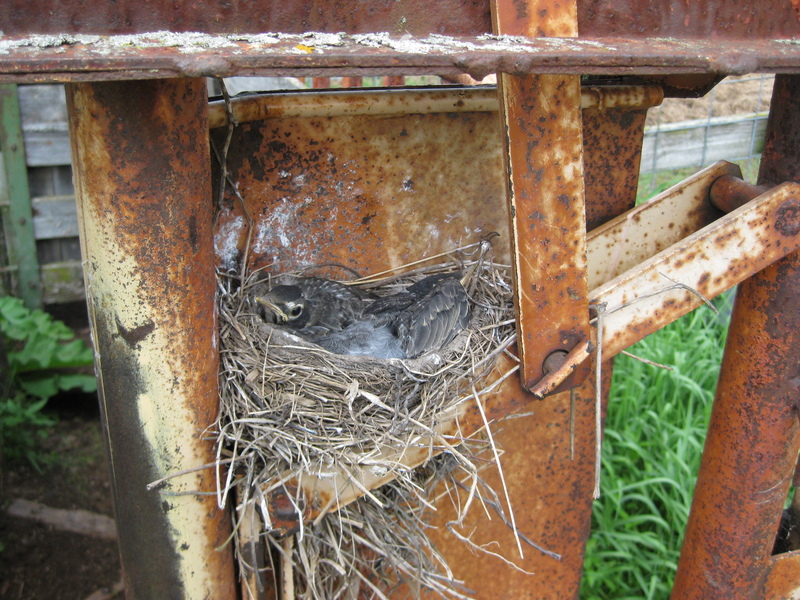 A robin’s nest, with fledglings, in our cattle catch-chute. Yes, and this picture explains why. We pulled two calves coming breach, (backwards), in April. We helped one calf nurse a cow with too-large teats. We transferred a twin calf onto a cow that had lost her calf in the creek. We pulled one large calf out of a heifer on May 7th. But that was it, out of more than 130 births. We didn’t use the corral from May 7th until the middle of June when we corralled some cattle for grass-finished beef. Calving problem-free cattle in April and May should be fun. I’ll keep you updated. Breeding isn’t going as well as I planned. Soon I’ll post about the problems we’ve already experienced early in this breeding season. This entry was posted on Thursday, July 15th, 2010 at 6:39 am and is filed under Curious cattle. You can follow any responses to this entry through the RSS 2.0 feed. You can leave a response, or trackback from your own site.